This is what YOU do!!! With Blightwatch, you'll get emails or text warnings in 10 selected postcode areas of Smith Periods, or "near misses". If I see a blight outbreak on the map close by, or get a notification of a "near miss" Smith Period, or full Smith Period, when blight is about in general, I start spraying with Dithane This has new been replaced by Bayer Fruit & Vegetable Disease Control . If unsure, I err on the side of caution and spray early rather than too late. This is not a cure, it's a preventative measure. Note, general - crops should not be eaten for 7 days after spraying, but read the label for full instructions. Therefore what I do if I think it's time to spray, is pick any tomato fruit that's ripe or will ripen in the next week, then spray. Then keep up the regime of spraying every 10 days until the danger is past. If you can nurse your plants throught he danger time, you'll get many weeks at the end of the season where you don't have to spray and can harvest tons of toms or spuds. One sachet makes a lot of solution, so if you've not got a lot to spray, you can half or even quarter it for your toms. Recommended measurements are available on the packet for your spuds! 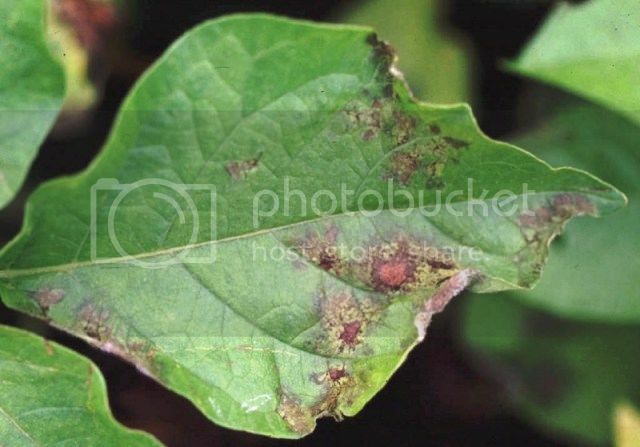 The foliage (otherwise known as haulms) typically develops brown patches with a white or yellowish 'halo' of spores around these patches when the weather is damp or humid. The leaves themselves can also become yellow. Cut off and destroy (do not compost) the haulms as soon as you ascertain it is blight (see picture for reference, though many more are available on google and yours may look slightly different to this picture). This will stop the blight spores entering the tubers (potatoes). 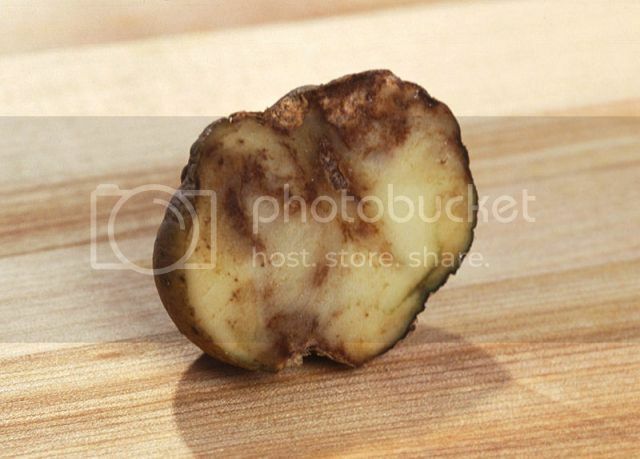 Leave the potatoes in the ground for at least a week to allow them to build up a tougher skin that will help with storage. There are blight tester kits available on the internet that you may wish to purchase to confirm blight before you remove the foliage. This link will tell you all about blight, Smith Periods and what to do.